UPDATE: A note on where to find the text of the "Common Prayer", and the letter co-signed by Cardinal Koch promoting it. UPDATE: In my original post I neglected to mention where the text of the "Common Prayer" can be found. It can be downloaded via a link at the bottom of the Lutheran World Federation (LWF) webpage containing the press release we reposted below: Press Release: A joint Catholic-Lutheran “Common Prayer” for 500 years of Reformation. Some apologists might try to defend this whole situation by harping on the description of the Common Prayer as a "template" that can be "adapt(ed) to local liturgical and musical traditions". To this "defense" we can easily point out that even if the scandalous prayers and readings in the original Common Prayer are treated de facto as optional -- and it is not at all clear that the foreseen adaptations are supposed to result in different prayers and readings -- they should not have been included in the first place in a "liturgical prayer" bearing the approval of a Curial dicastery headed by a Cardinal of the Roman Church. Last year saw unprecedented expressions of "openness" on the part of some Vatican officials (including the Pope) and official Catholic structures towards Lutheranism. First there was the support expressed by a Vatican spokesman for the renaming of a square in the central part of Rome after Martin Luther, support that was never disowned by any higher ecclesiastical authority in Rome. Adventists and Lutherans had been trying since 2009 to get a square in Rome named for Luther, but the effort garnered success -- and Vatican support -- only last year. Then there was the publication on October 30, 2015 -- eve of "Reformation Day" -- of the "Declaration on the Way: Church, Ministry and Eucharist", which among other things calls for "the expansion of opportunities for Lutherans and Catholics to receive Holy Communion together". This document was created by a task force that was co-chaired by Bishop Denis J. Madden (Auxiliary Bishop of Baltimore) and formed by the USCCB's "Bishops' Committee for Ecumenical and Interreligious Affairs" and the Evangelical Lutheran Church in America. (The document itself is hosted on the website of the USCCB). Just prior to this was the Ordinary Synod of Bishops, which based its work on an "Instrumentum Laboris" that, among other things, proposed that the baptized but non-Catholic spouses of Catholics, as long as they "share the Church’s faith in the Eucharist", be admitted to Holy Communion. Fortunately this proposal did not pass muster and the Final Relatio of the Synod -- so weak and ambiguous in many other respects -- passes over it in silence. Although Lutherans were not mentioned by the Instrumentum Laboris, one can see that Lutherans -- alongside Anglicans and Eastern or Oriental Orthodox -- would have benefited the most from this proposal. Mid-November saw Pope Francis visit the Lutheran church in Rome, during which he gave his controversial answer to a Lutheran woman who expressed her desire to receive Holy Communion in a Catholic church. Although some apologists and "conservatives" scrambled to come up with tortuous explanations that the Pope really meant to tell the woman that she should become Catholic, the pastor of the same Lutheran church where Francis made his remarks opined that "he thinks his flock feel freer, in accordance with their conscience, to receive the Eucharist in the Catholic Church after Francis’ comments." 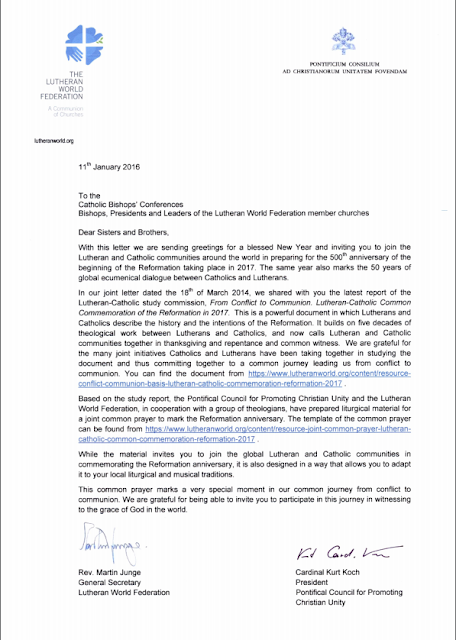 Now comes news that the Lutheran World Federation, and the Pontifical Council for Promoting Christian Unity headed by Kurt Cardinal Koch, have endorsed a "liturgical order" designed to facilitate common prayer between Catholics and Lutherans in the run-up to next year's commemoration of the 500th anniversary of the Protestant Reformation. This liturgical service is based upon the document "From Conflict to Communion" jointly issued by both bodies in 2013 as a blueprint for a "common commemoration" of the Reformation in 2017. Our commentary on its significance, and on salient points of this "liturgical service", comes after the text of the press release. 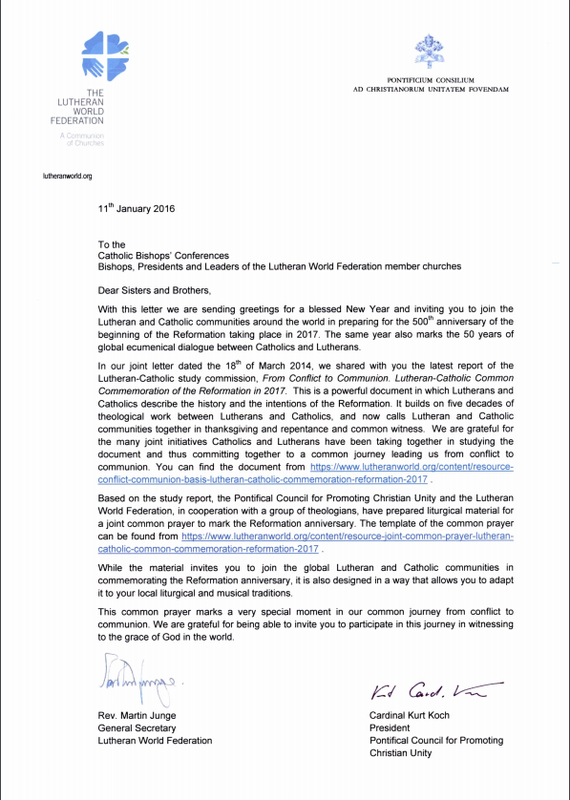 GENEVA/VATICAN CITY, 11 January 2016 - The Lutheran World Federation (LWF) and the Pontifical Council for Promoting Christian Unity (PCPCU) have invited Lutheran churches and Catholic bishops’ conferences across the world to make use of a jointly-developed Common Prayer to prepare commemorations for the 500 years of the Reformation in 2017. In a joint letter today to the Catholic Bishops’ Conferences and to LWF member church bishops, presidents and other leaders, LWF General Secretary Rev. Dr Martin Junge and PCPCU President Kurt Cardinal Koch introduce the Common Prayer for Lutheran-Catholic common commemoration of the Reformation in 2017. The document is the first jointly developed liturgical order prepared by a liturgical task force of the Lutheran Catholic Commission on Unity of the LWF and PCPCU. It is based on the recent study report From Conflict to Communion: Lutheran-Catholic Common Commemoration of the Reformation in 2017, and is calling the Catholic and Lutheran communities for joint prayer in this commemoration. The Common Prayer includes materials that can be adapted to local liturgical and musical traditions of churches in the two Christian traditions. ”This common prayer marks a very special moment in our common journey from conflict to communion. We are grateful for being able to invite you to participate in this journey in witnessing to the grace of God in the world,” Junge and Koch write to the Lutheran and Catholic Church leaders. The two leaders express gratitude for the many joint initiatives and commitment by Catholics and Lutherans in studying together the document From Conflict to Communion, in which the two church bodies describe together for the first time the history of the 16th century Reformation and its intentions. The report developed by the Lutheran-Roman Catholic Commission on Unity in 2013 has been widely distributed to Catholic and Lutheran communities. It is available in the four LWF’s official languages – English, French, German and Spanish – and has been translated into several other national and regional languages. The Common Prayer is a practical guide to a process of worship for a joint Catholic-Lutheran commemoration of 500 years of the Reformation. It is structured around the themes of thanksgiving, repentance and commitment to common witness. The aim is to express the gifts of the Reformation and ask forgiveness for the division perpetuated by Christians from the two traditions. ”It offers an opportunity to look back in thanksgiving and confession and look ahead, committing ourselves to common witness and continuing journey,” states the preface of the Common Prayer. It offers suggestions of how Catholic and Lutherans should preside and read together at a common prayer service. Examples are provided of hymns and songs from a variety of multicultural contexts, as well as biblical and confessional readings that reflect mutual joy and repentance, and the desire to serve and witness to the world together. In October this year, the LWF and PCPCU will host a joint Ecumenical Commemoration event in Lund, Sweden, where the LWF was founded in 1947. It is true that since the 1960's, it has become commonplace for Catholic theologians and bishops to praise Martin Luther and the Reformers. Popes have not been exempt: witness John Paul II's 1983 letter for the 500th anniversary of Luther's birth praising his "profound religiousness" and Benedict XVI's 2011 speech to representatives of the German Evangelical Church. Joint prayer between Catholic and Lutheran (and other non-Catholic and even non-Christian) dignitaries are also not uncommon. Nevertheless, previous Popes always resisted Lutheran pressure for Catholic-Lutheran intercommunion to be normalized even without visible ecclesial unity. Under the present pontificate this resistance looks significantly weaker -- if it exists at all. This is also the first time that the drive for Catholic-Lutheran union and the glorification of the Reformation has taken a quasi-liturgical shape, intended not just for relatively rare "ecumenical encounters" but for Catholics and Lutherans worldwide. As Traditionalists know only too well, prayer and belief go hand in hand. The dangerous implications of this step are plain for us to see. The opening prayer of the service prays that the Lord "help us to rejoice in the gifts that have come to the Church through the Reformation, prepare us to repent for the dividing walls that we, and our forebears, have built, and equip us for common witness and service in the world". Thanks be to you O God for the many guiding theological and spiritual insights that we have all received through the Reformation. Thanks be to you for the good transformations and reforms that were set in motion by the Reformation or by struggling with its challenges. Thanks be to you for the proclamation of the gospel that occurred during the Reformation and that since then has strengthened countless people to live lives of faith in Jesus Christ. “Lutherans are thankful in their hearts for what Luther and the other reformers made accessible to them: the understanding of the gospel of Jesus Christ and faith in him; the insight into the mystery of the Triune God who gives Himself to us human beings out of grace and who can be received only in full trust in the divine promise; the freedom and certainty that the gospel creates; in the love that comes from and is awakened by faith, and in the hope in life and death that faith brings with it; and in the living contact with the Holy Scripture, the catechisms, and hymns that draw faith into life." This "liturgical order" is characterized by the dominance of Protestant material, and the one-sided praise for the Reformation while nothing at all is said about -- or taken from -- the distinctive elements of Catholic history, theology and heritage. The Reformation and Martin Luther are repeatedly extolled, while the Counter-Reformation and the Popes and Saints of the 16th century are passed over in total silence. The troubles that came from the Reformation are thoroughly glossed over in the "Repentance" section of the service that covers doctrinal disagreements and historical tragedies in banal generalities which equally blame Lutherans and Catholics. The overwhelming emphasis in this service is on what supposedly unites Catholics and Lutherans, while the doctrines that "divide" us -- doctrines for which innumerable Catholic martyrs and confessors suffered, bled, fought and died -- are left unmentioned and abandoned.